One fall can change your life forever. A slip-and-fall attorney can help you get back on track. In Nevada, landowners owe a duty of care to their guests to act reasonably in preventing or warning of dangerous conditions. Dangerous conditions include spilled liquid on the floor, tripping hazards like uneven walking surfaces, and open trenches. Victims of a slip-and-fall or trip-and-fall accident may recover from a landowner if they can prove that the landowner or one of its employees caused, knew about, or should have known about a dangerous condition on its property, but took insufficient steps to fix the problem or warn guests of the problem. In a slip-and-fall case, proving that the landowner had knowledge of the dangerous condition is often the most difficult part of the case, which is why it is crucial that an attorney is contacted as soon as possible after the accident. Commercial landowners, like hotels, grocery stores, and banks usually have video surveillance, but unless they have a reason to preserve the video, there is usually a fairly short time before the video is recorded over. As soon as you can, if you contact Parry & Pfau, we can send a preservation-of-evidence letter, letting them know that there was an accident, and asking that the video evidence be preserved. If they fail to do so, there can be negative consequences that a jury is entitled to hear that may weaken their defense. In addition to video, other records, like sweep sheets and cleaning and maintenance records, need to be preserved and can be addressed in a preservation-of-evidence letter. Perhaps more than any other kind of case, it is critical with slip-and-fall cases to contact an attorney immediately after the accident. 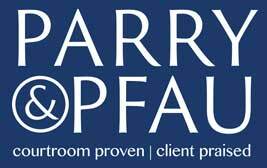 At Parry & Pfau, we know which steps you need to take to protect the evidentiary value of your case.